The growing popularity of object-based storage has resulted in the development of Ethernet-connected storage devices, herein referred to as IP-Based Drives and subsystems supporting object interfaces and in some cases the ability to run localized applications. Typical scale-out storage nodes consist of relatively inexpensive enclosures with IP network connectivity, CPU, Memory and Direct Attached Storage (DAS). While inexpensive to deploy, these solutions become harder to manage over time. 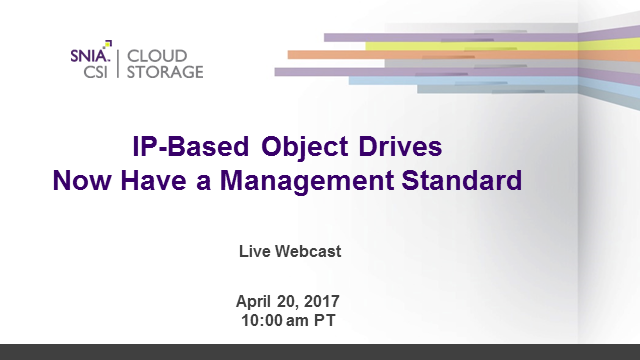 This standard allows drive management to scale to datacenters and beyond, enabling automation and Software Defined Datacenters.